SSC CPO 2018 Tier-1 Exam date has been postponed to an undisclosed date (unaware about date). 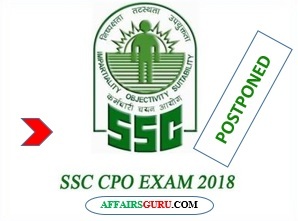 Earlier, the SSC CPO (Central Police Organisation) exam was to be held from 5th to 10th June 2018 but commission has postponed it due to some administrative reasons. The new exams date will be released soon on commission official website. SSC(Staff Selection Commission) has postponed the Exam dates for SSC CPO Paper-1 until further notice by SSC. Earlier the exam was scheduled from 4th June to 10th June 2018. The new exam dates will be intimidated to aspirants once it has been confirmed by SSC. Candidates can find the syllabus of SSC CPO by clicking on below link. Candidates can know about the salary of officers selected in SSC CPO by clicking on below link. Check the official notification regarding the postponed of exam dates by clicking on below link.